Private Profits Club Review - Scam Costed Me $250! Private Profits Club Review – Scam Costed Me $250! Private Profits Club is yet another binary trading software scam that promises to make its members huge profits, but don’t be fooled. I’ve had multiple readers who lost at least $250 deposit to Private Profits Club scam within 24 hours. If you are still hesitating to fund your trading account, make sure you read this Private Profits Club review first. I’ll reveal all you need to know about the system, and why you should invest your money somewhere else instead. The alleged owner of Private Profits Club, Mark Adler guarantees that you’ll make hundreds of thousands of dollars in the next 30 days (screenshot above), or he’ll pay $10,000 to you out-of-pocket. This is a typical red-flag for online scams, where they make over-the-top promises. As a rule of thumb, be extra skeptical when an online opportunity sounds too good to be true. Private Profits Club checks all these boxes, considering what it is promising. This is consistent with the experience of my several other readers, where they reported losing $250 and $300 respectively within 24 hours. There are many other binary trading software scams out there, and chances are you will encounter more of them in the future. Fortunately, there are ways to spot these scams without having to pay for it. I’m sure you remember the video testimonials shown at the beginning of their sales video, where “members” of the system claims to have made huge profits from Private Profits Club. Unfortunately, none of these testimonials are real. They are all actors and actresses hired from a freelancing website, Fiverr.com for a fee. These semi-professional spokespersons sell fake testimonials for a living. Let’s take a look at the gig description of this actor. 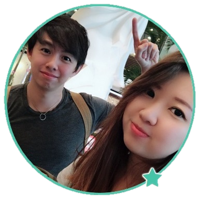 He provide a basic testimonial for as low as $5 per 50 words. Not only that, clients must provide him with a script, where he reads as if it’s a piece of real testimonial. In this case, the scammers behind Private Profits Club provided a script and hired this Fiverr actor to pretend that he has made money from the software. What you see in the video wasn’t a real testimonial. This Fiverr actor was just reading the script provided by the scammers. He has never used the software, much less profiting from it. I’ve done the background check for all the members featured in video testimonials, and every single one of them turned out to be a Fiverr spokesperson. I do not condone or condemn the act of buying and selling fake testimonials, but I want my readers to be aware of this – that fake testimonials can be bought from the internet extremely easily. Besides, if there are real members who are satisfied with the performance of the software, Private Profits Club wouldn’t have to buy fake testimonials to promote the scam. Below the sales video, we can see the profile for the alleged owner of Profits Private Club, Mark Adler. As usual, I’ve done a background check for him and realized that his photo was purchased from a stock image vendor called gettyimages (screenshot above). Stock images are royalty-free images that can be purchased by anyone from the internet for advertising purposes. Once you buy the photo, you can use it anyway you like without copyright issues. 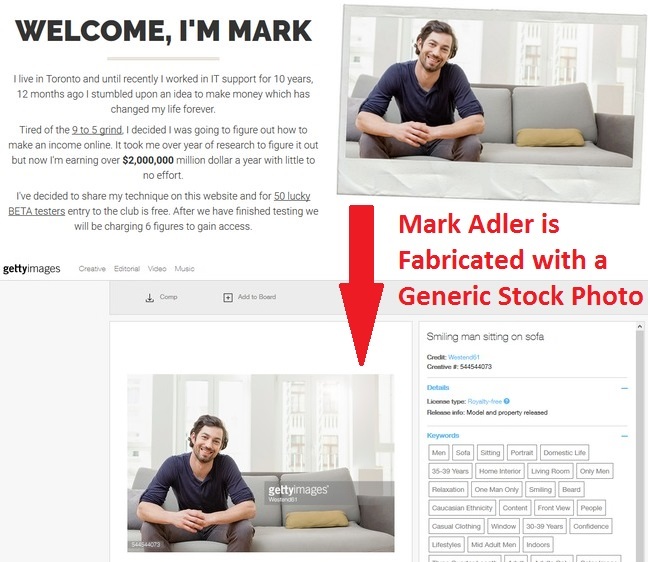 Apparently, the scammers behind Private Profits Club bought the photo and fabricated the fake identity of “Mark Adler” for him. There are many other website that use the same photos with different identities. In fact, there is no founder for Private Profits Club system. It is just a generic binary trading software that generate random losing trades for its users. To make the software appear more legitimate to victims, the scammers fabricate fake members and a fake founder, just like what we see above. Don’t be deceived by these common scam tactics. No one is making money with the app, as evidenced by the huge losses of my readers. How Does The Scam Make Money Off You? If you decide to sign up for Private Profits Club app, you will be redirected to another joint scam called Chrono Trader in their member’s page. After that, you are required to open a new broker account with their partner brokers, which are unregulated by monetary authorities. Once you fund your trading account with at least $250, the software will be activated to generate automated trades on your behalf. However, it is just a generic binary trading robot that make random trades for the users. Victims typically lose all their deposits within hours of activating the software. The losses are pocketed by the broker, which is then shared with its partners-in-crime – the scammers behind Private Profits Club and Chrono Trader system. In the end, internet users like you and me become the sole losers in this complicated fraud, while the scammers make a handsome profit with our trading deposits. So, Is It Possible to Make Money Online? PRIVATE PROFITS CLUB IS A SCAM. I strongly advise you to stay away from the scam if you don’t want to lose your hard-earned money. You’ll be better off spending that $250 deposit for a nice dinner with your family than wasting it on a scam like this. Read Review of the Most Recommended Internet Business Opportunity Here. Have you encountered any online scams before? Personally I’ve fallen for a few before coming across the legitimate one, so let us know in the comments below if you have any personal experience to share! Scalper Bot 1000 Review – Scam Bot Doesn’t Work! High Frequency Trader Software Review – Scam Alert! I was immediately contacted by a broker upon leaving my phone number, who was very slick pushing me to open an account for $250 which was to be matched by them with $250, giving me $500 to start “trading”. I asked them for 24 hours to think about it… if what you’re saying is all true then it is a scam, no doubt. Nobody has mentioned being contacted by a representative on the phone which seems to offer some legitimacy…? The representative was your account manager, whose job is to get you to fund your account. As for the equal matching, it’s a trick to lock your fund in your trading account. Check the broker’s website for the terms on matched bonuses. Once you accept a bonus, usually you will have to perform a certain number of trades before you are allowed to withdraw your funds. By the time you completed the said number of trades, your account would’ve been depleted. I’m Edward, founder of this website. If you want to learn about affiliate marketing and building a stable side income from the internet, I think you can learn a thing or two here!